Fences are attractive to homeowners for a variety of reasons: fences can increase yard privacy, reduce noise from neighbors, provide an enclosure for pets, and make a yard look attractive. For these reasons and others, homeowners chose to have fences installed by contracting and fencing services. When you need a fence installed, you can trust the local technicians at Sears Handyman Services to get the job right. Our professional handymen have experience with several kinds of home improvement projects, including fence installation. For budget-friendly, quality craftsmanship, call on Sears Handyman Services. Privacy fences are typically made from tall, sturdy pieces of wood that surround your yard or enclosure. These fences prevent people from seeing into your yard, but they also reduce noise and define the perimeter of your property. 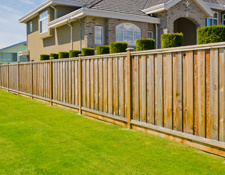 Many homeowners enjoy the added safety element and the aesthetic quality of a privacy fence around their yard or home. While many homeowners enjoy their privacy fence, installing them from scratch can be a difficult task. Correctly installing a privacy fence involves digging fence post holes and then aligning and plumbing posts. These steps can be more complicated than they sound. This is especially true if there are obstacles in the path of the fence that need to be moved or removed (trees, bushes, etc. ), if there are rocks or tree roots underground where the posts need to be buried, or if the ground is not level. Sometimes on-the-spot adjustments will need to be made to ensure the fence remains level and straight. When you want a privacy fence but aren’t sure if you can install it correctly or you worry you don’t have the time, you can call a Sears Handyman professional. 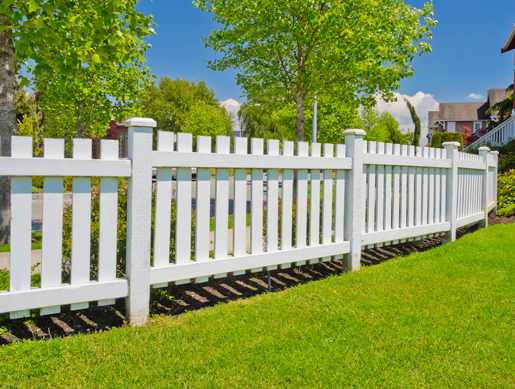 Our technicians are practiced at woodworking and fence installation projects, and they’ll discuss your fence needs in detail before the project starts, so you can be sure to get the fence you want. For fencing options, chain link fences are another popular fencing style. Due to their low material cost and relatively quick installation, chain link fences are a great way to affordably install effective fencing. 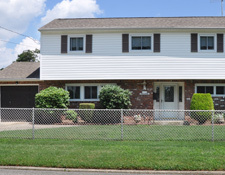 Many homeowners also enjoy the fact that chain link fences do not obscure the sunlight while still creating a property boundary and yard enclosure for pets. Chain link fences are typically a manageable project for an experienced handyman. The installation process typically involves digging holes for fence posts in parallel lines and wiring the chains through the posts to create the barrier, and finally topping the chains with fence ties and adding any gates if needed. For professional handymen, chain link fence installations can usually be completed fairly quickly. If you need a chain link fence installed, you can call a local Sears Handyman technician for help. Our handyman professionals will be happy to walk you through the specifics and timetable of a typical chain link fence installation. For these and other fencing needs, call a Sears Handyman representative today.